Praised by both Opera News and the Washington Post for his "powerful, rich warm baritone," Elias Mokole is equally at home in recital, musical theatre and orchestral concerts, as well as opera. 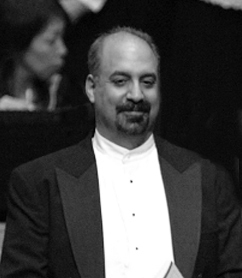 A multiple award winner in voice competitions internationally and a lifelong learner of everything from Opera to voice to French, Elias has brought a rich background to his work and allows him to continually delight audiences throughout the U.S. and abroad. Performance highlights include: Germont in La Traviata, Enrico in Lucia di Lammermoor, Sharpless in Madame Butterfly, Scarpia in Tosca, Ford in Falstaff, as Elijah in Elijah, the title role in Gianni Schicchi, and soloist for the Brahm’s Requiem with various operas and symphony orchestras throughout the U.S. Internationally, Elias was the soloist in Handel’s Messiah, Bach’s Weihnachtsoratorium in Japan [Osaka, Tokyo], as Valentin in Faust and the Mozart Requiem [Paris], as Agamemnon in Offenbach’s La Belle Helène at UNESCO [Paris], in Lyon, France with L’Ensemble Orchestral Contemporain as soloist in Shostakovich’s Symphony No. 14 and Sharpless in Madame Butterfly Algiers [Africa]. Last summer, Elias performed with the Duluth Playhouse as Juan Perón in Evita and most recently starred as Gianni Schicchi with the Queens Symphony Orchestra. He is currently working on a cross collaborative musical presentation and was the keynote speaker for the Online and Technology-Enhanced Learning Conference held at the University of Minnesota Duluth. He will return to Europe to work with colleagues on his Jardins de Paris model, a creative collaborative experience connecting educators, creative professionals and students from Music, Art Design, History, Foreign Languages and the Sciences. He will also be giving private and public performances in France and Germany. Recently in San Antonio, Elias educated students at Longs Creek Elementary School about Opera and conducted an Opera Workshop for the fifth graders in preparation of their May visit with the San Antonio Symphony as a part of the symphony’s “Link Up” program as well as is collaborating with Grow with the Arts here in San Antonio to launch a smart phone app project that will link art, music, culture and history. This project will benefit students, tourism and the City of San Antonio.